FabFoodFriends: Very sticky, but not at all icky! Yesterday me and my au-pair child made "Kladdkaka". 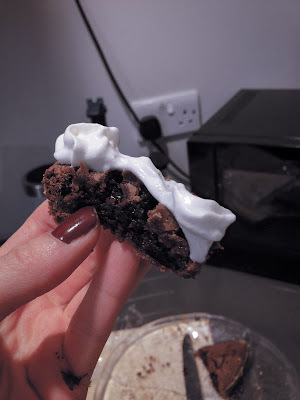 It's a Swedish brownie like cake, but a bit stickier then its American friend. If you directly translate the Swedish name for the cake, it's "Sticky Cake" in English. This is DELICIOUS! 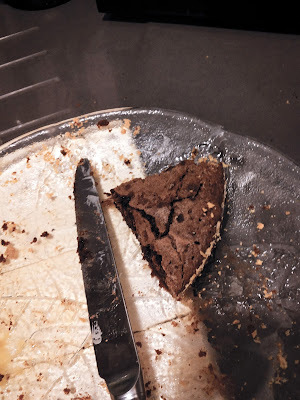 My other au-pair child likes neither ordinary chocolate cake nor brownies, but he absolutely loved the Swedish Sticky Cake! 1. Always start by starting the oven. Set the oven to 175° Celsius. 2. Put the butter in a saucepan and melt it on low heat. 3. Take a round ovenware and place a bit of butter in. Take some tissue paper and spread the butter out in the entire thing. 4. Once the butter has melted, turn the heat of. 5. Now take the biscuits and put them in a plastic bag. Fold the bag and then take a baking roller and start to smash the biscuits into crumbles. Once there is no big bits left, only flour-looking crumbles, you pore them into the ovenware. Swirl the ovenware around so the crumbs stick to the butter and cover the entire inside. If there is crumbs left once all is covered, then put it upside down over the sink and lightly tap it. 6. Take the melted butter and whisk down the two eggs in it. 7. Put the sugar, the flour, the cocoa and the vanilla sugar into a bowl and stir it. 8. Pore the content of the saucepan into the bowl and mix it with a spatula. Done! Now you can eat it as it is, or you do it the traditional way and serve it with some icing sugar and whipped cream on top.